To kick off Filipino American History Month and U.N. /Philippines Indigenous Month, San Francisco’s Asian American Museum held a premiere of Mountain Spirits: Textiles and Folk Arts of Cordillera and Ilokos, the signal documentary of The Hinabi Project's third exhibit on Philippine textile arts. The documentary traces the diaspora of textile art among the mountain cultures of the Cordillera and coastal weavers of Ilokos. A dance and music performance of the International Dayaw, from the National Commission for Culture and Arts of the Philippines (NCCA), directly brought the culture of the Cordillera to an audience of about a hundred museum patrons, students and textile and dance enthusiasts, . 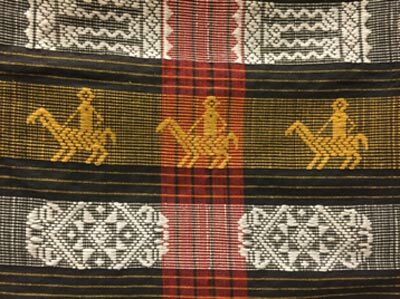 Now on exhibit at the Mills Building Art gallery on 220 Montgomery St. in Downtown San Francisco are textile works and folk arts from the Cordillera region of Northern Luzon. A landlocked region between the western and eastern Ilocos provinces, a string of mountains and valleys is home to more than a dozen ethnolinguistic communities, some of whom are known for their excellent textile, embroidery, basketry and woodcraft, some examples of which can be seen at the exhibit. The textiles show the subtle weave, color and embroidery style that is distinctly Cordilleran. Also showcased are photographs, and objects that Cordillerans use in their celebratory activities as well as daily lives and rituals. The exhibit may be viewed as the return of the “Igorot,” a historically loaded term previously considered a pejorative colonial erasure of the distinctions among the unique cultures of the Ifugao, Bontok, Kalinga communities, to name a few. Filipino Americans can reflect on a lurid experience of a century ago, when Cordillerans, then labeled “Igorottes,” were paraded in American cities as live exhibits. The Philippines during 1899-1935, newly acquired by the U.S. as the victor's prize in the Spanish-American War, became the experimental ground for “exporting democracy,” a euphemism that made colonial rule over the Filipinos more palatable to the American public. Downplaying a cosmopolitan Hispanic Manila culture and to further convince the public that “civilizing” efforts were needed in the archipelago, colonial officials and former Philippine American War soldiers brought Igorottes to the United States as human exhibits. The exhibits were recruited from the mountain provinces, paid minimal wages, given poor accommodations and then paraded about in American cities like San Francisco as proof of the Philippines’ backwardness and unfitness for independence. The Igorotte Village became the most prominent attraction at the St. Louis World Exposition of 1904. Contrived replicas of mountain villages featured ethnolinguistically distinct inhabitants of the Philippines, from Aetas, Bagobos and Moros to Hispanized Filipinos installed in their respective habitats. In the 19th century, museums like Chicago’s Field Museum and the Smithsonian frenziedly collected artifacts of tribal art and craft. These artifacts, now buried and forgotten in archival warehouses, have rarely been exhibited. They remain to be re-discovered for their artisanship and artistry. The current exhibit at the Mills Building in San Francisco hopes to dispel historical distortions and highlight the resilient cultures reflected in textile craft and folk arts. To heighten the notion of strength in diversity, International Dayaw included cultural masters from the Subanen of Zamboanga, Mindanao. In their unity dance, accompanied by the throbbing beat of bamboo and gong instruments, the Cordillerans and the Subanen, came together in the budong, the traditional peace ritual of the mountain peoples. This coming together marks a laga, a weaving of diverse threads of cultures with common ancestral roots. The documentary, the exhibit, and performances were achieved under the aegis of The Hinabi Project, an initiative of the Philippine American Writers and Artists (PAWA) in partnership with the NCCA, the Department of Tourism North America, the NGO Non-Timber Forest Products Exchange Programme, the Philippine Consulate General of San Francisco, and the Asian Art Museum. The film was shot on location by LivingAsiaChannel.TV in August this year. Officially launched on September 22 at the Kalayaan Hall of the Philippine Consulate , with a spectacular rendition of Cordillera lore by the Parangal Dance Company of San Francisco, the exhibit will run from October to December 7 at the Mills Historic Building on 220 Montgomery. Film screenings and Dayaw performances were held at the Oakland Asian Cultural Center and the Kalayaan Hall at Sutter Street last week. In both locations, indigenous textiles and crafts were available for sale. Dayaw International's final performance was at City College of San Francisco’s Wellness Center on Phelan Ave. Close to a hundred students, folk dance enthusiasts and faculty, watched and later joined a dance workshop with the Dayaw dancers for lessons on Cordillera and Subanen dance movements. The evening ended with the audience dancing and beating gongs in a shared circle. Weavers were the first “design thinkers,” even before the term became a Silicon Valley mantra. A more precise term would be “textile thinking,” a mental process that involves meticulous planning and pre-visioning, a mathematical and logistical calculation to produce six meters of designed fabric. Fiber must be procured, if not grown; dyes prepared, if not planted; social and domestic activities planned such as farming and rituals scheduled; daylight hours calculated. The whole process, in effect, sets the “brand” of the textile. Among ancestral weavers, design takes on the function of a family “crest,” the composition of which identifies their family and community. The pattern of frog and lizard symbols, flowers, leaf and rice stalks are woven into the fabric that would be edged with repeated abstracts of mountain ridges - the Cordillera. The differences are subtle. Just as their dialects are unique, so are their textiles. The textiles are markers of linguistic identity and status in a flat social structure where status is evident only in the number of textiles owned. The weaver's method is almost ritualistic, and in older times, it required the proper offerings to the spirits. The yarn is colored with natural dye from ginger or indigo plants, mud, and tree bark. The whole process is ecologically correct and sustainable, mathematical too. Ateneo University mathematics professors have explained the theory of symmetry and the calculus of repetition evident in indigenous textile designs. CORDITEX, a science lab in Baguio City, is investigating the possibility that design decisions were calculated to improve the overall tensile strength of the fabric. In this context, avoiding math errors, miscounts of thread and insertions, are a must. To unravel an error is the last thing a weaver will want to do. Beauty is also mathematically correct. This is evident in the binakol design, a pattern typical among the indigenous weavers. The term, binakol/binakel, translate as "to do a sphere.” Imagine the mathematical challenge of achieving this with a technique that is fundamentally linear -- vertical warp and horizontal weft. In some Southeast Asian cultures, the warp and weft are representations of cosmic unity at the point of convergence. They may also symbolize male and female. The binakol is the weaver's solution to the problem of creating a circle from a square. By subtly weaving graduated squares with threads of different colors and thicknesses, a 3-D rendition of a basket is produced. This single design, common to indigenous weavers in different iterations -- arabesques, spirals, and whirlpools (kusikos)-- establishes the performative nature of textile. It is said that among weavers, the binakol serves as protective clothing and a way of confusing evil spirits and their evil intentions. Several baskets displayed are precursors of contemporary backpacks and fanny packs. Aside from the craftsmanship, they project ideas of conservation and sustainability. Backpacks woven from fine strands of rattan have built-in double pouches, one for tools, the other for food. One backpack, locally called pasiking has a woven cover of palm fiber that serves as a waterproof raincoat over the basket. Cordillera textiles and design culture dispute the prejudiced representations by the 19th century American colonial who was bent on pursuing a political agenda.